The original Skad Lure has accounted for thousands of bass, pollack and cod, to name but a few, but we have frequently been asked for a 'Weedless' version – so here it is! In practice, however, as any lure or boat fisherman knows, nine times out of ten, if you snag the lure you lose the lot! Why over complicate it then? We already have a superb, proven 'fish-catcher' in the original Skad Lures so why not just make a weedless version of that? So that’s what we did! 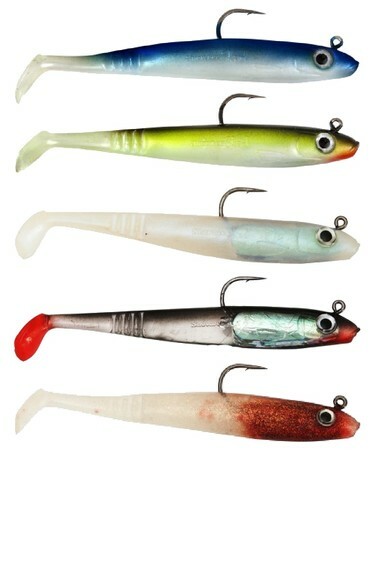 Aimed squarely at the lure and boat fisherman and using the same tried and tested tail design as the original Skad lure. 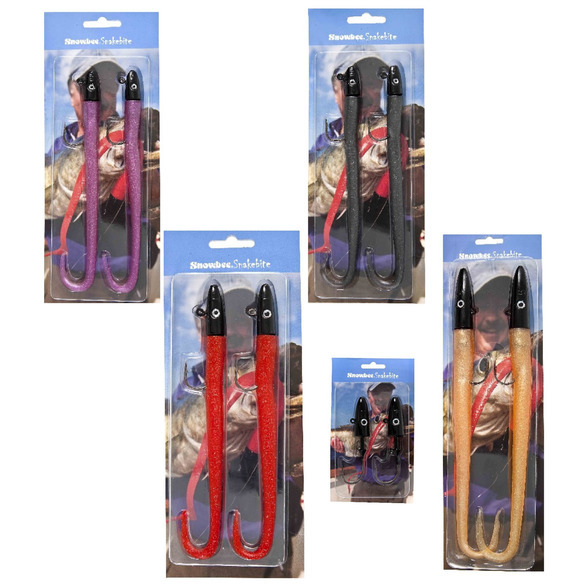 No more 'fiddling in the dark' with wet hands to change the body… no more torn plastic bodies before you have even started fishing! …Just tie it on and go fishing! Our Stinger Skad lures have revolutionised the lure fishing market with regular reports of them out-fishing many previous market leaders! Since the early days of modern wreck fishing, back in the 1970’s, we have seen gear and lures evolve to where they are today. 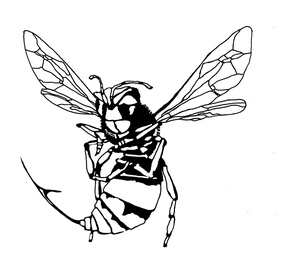 During this time however, the Snowbee team have watched with interest, but always knew we could do better… and we have been proved correct, by the success of the Stinger Skad! We always felt that both the Sandeel and Shad patterns had their limitations, depending on what the fish were feeding on at the time. 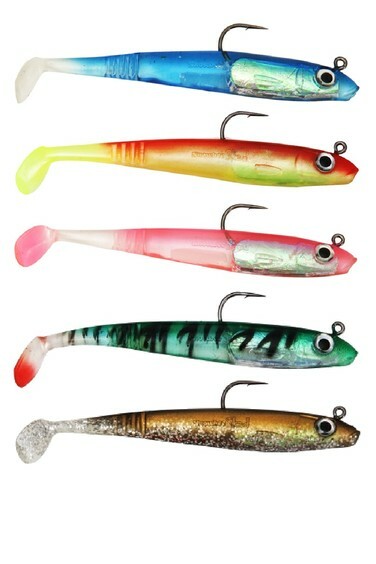 So, the Skad lure is a hybrid of the two – heavier set than the Sandeel patterns, but not as heavy as the Shads. In this way, it cunningly imitates both and will fish effectively, when fish are feeding on either sandeel, or small baitfish such as pout, mackerel or herring. The advantage of this clarity is a clear light reflection, off the outer surface, coupled with an enticing holographic shimmer, off the internal lead-weight foil wrap – a combination which any predatory fish finds irresistible. The Skad can be fished on a traditional long flowing trace and boom, over reef or wrecks, for species such as pollack, cod and ling, or used as a casting lure for inshore species such as bass, pollack, mackerel etc. Either way, they are lethal fish catchers! On our first trip with the prototype samples, aboard the Snowbee ‘Deep Blue³’, just a single lure accounted for over a dozen fish, including ling to nearly 20lbs. The lure? A little chewed up, as you’d expect, but quite capable of fishing again… and again! 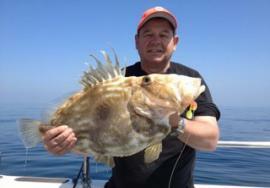 Superb John Dory caught on a day trip aboard Hugh Shepherds Snowbee sponsored boat, Patient Pursuit - July 2013. The fish fell to one of the new Rhubard and Custard Skad lures and was part of a haul including some excellent Bass too. With better weather conditions finally, the charter boats around the country have been able to venture out on a more regular basis and the new Skad lures have been accounting for a number of remarkable catches - this being one of them. Being avid boat fishermen, we have always been disappointed by the quality & design of booms available – so we designed our own! Our new, versatile Boom-Kit consisting of two short ledger booms, plus 4, ‘cut-to length’ long booms. Push these into the short booms to convert them instantly to 10” Wreck/Reef Booms. Complete with heavy duty S/S lead clips. Our purpose-designed disgorger quickly and easily removes all types of hooks, with minimal handling of the fish, making it the ideal tool for ‘catch & release’. 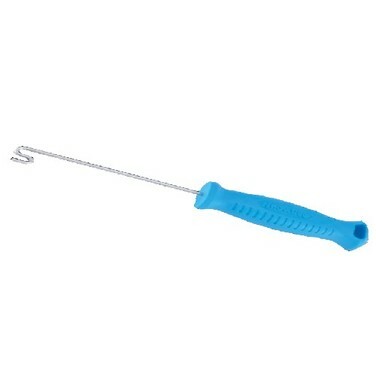 The unique head design allows ‘pushing’, as well as ‘pulling’ on hooks, perfect for removing treble lure hooks. 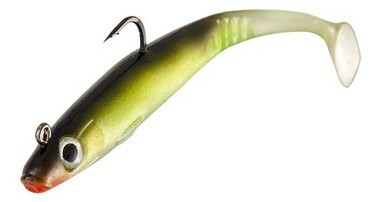 The idea for the Snakebite lures came from a snake-like lure we came across, while ‘Striper’ fishing in Cape Cod. Being avid wreck fisherman, we could immediately see the potential for such a lure in our waters. We gave it our own ‘twist’, by adding a ‘curly-tail’ and using a super soft, but very strong silicone plastic to mould it from. 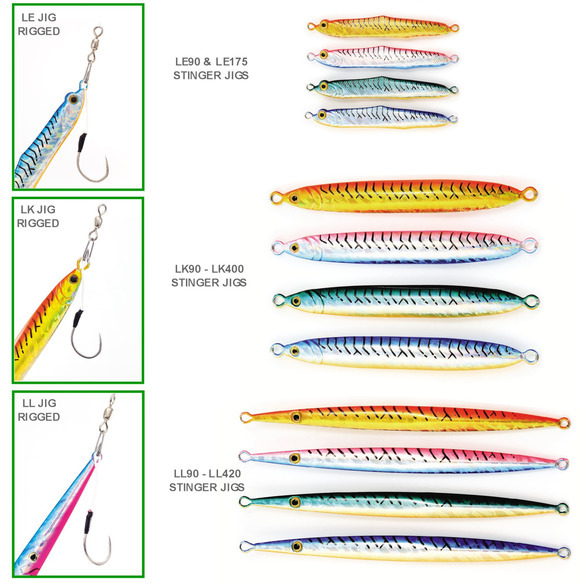 Add a lead jighead and the result is an ultra-realistic lure, with an action which sends predatory fish crazy! On the first offshore trip with the 10” models, we had double figure Pollack hitting them so hard, all you could see was the lead-head in their throats! Since then, Snakebites have accounted for large Cod, Ling and Whiting, as well as Bass in the smaller sizes. The 6” version can be used with a traditional boom and flowing trace, or as a casting lure for jig-style spinning for inshore species such as Bass, Pollack, Mackerel & Garfish. The 10” version is fished as a stand-alone jig-style lure and either fished ‘sink and draw’ style, for Pollack, or ‘jigged’ tight to the bottom for Cod and Ling, where the action of the 10” tail provokes vicious strikes. Developed by the Snowbee product development team over a period of 18 months and exhaustively tested ‘in anger’, not only do these jigs out-fish eels and shads every time, but we have also put them up against just about every other brand of jigs, including the market leaders and they have out-fished all of them on the day. 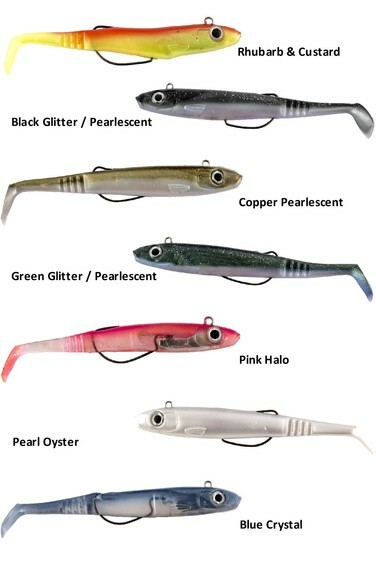 Available in a range of designs and weights, all models come in a choice of the four most popular colours – Blue Mackerel, Green Mackerel, Pink/Blue and Orange/Gold. 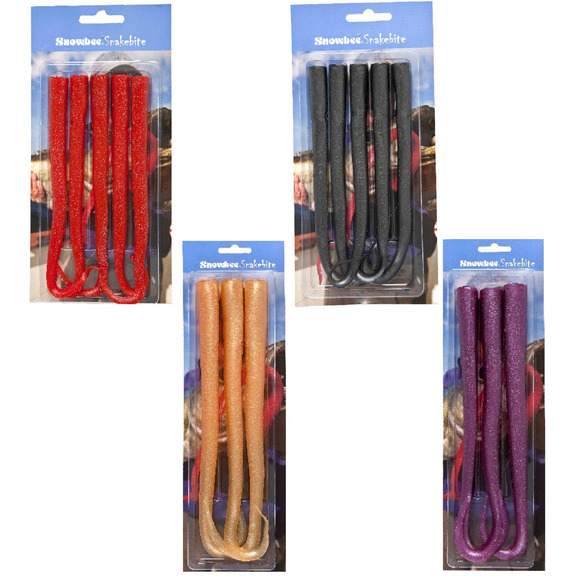 These have proved to be the most effective colours in all fishing situations. Other colours offered by competitors are to catch anglers, not fish!